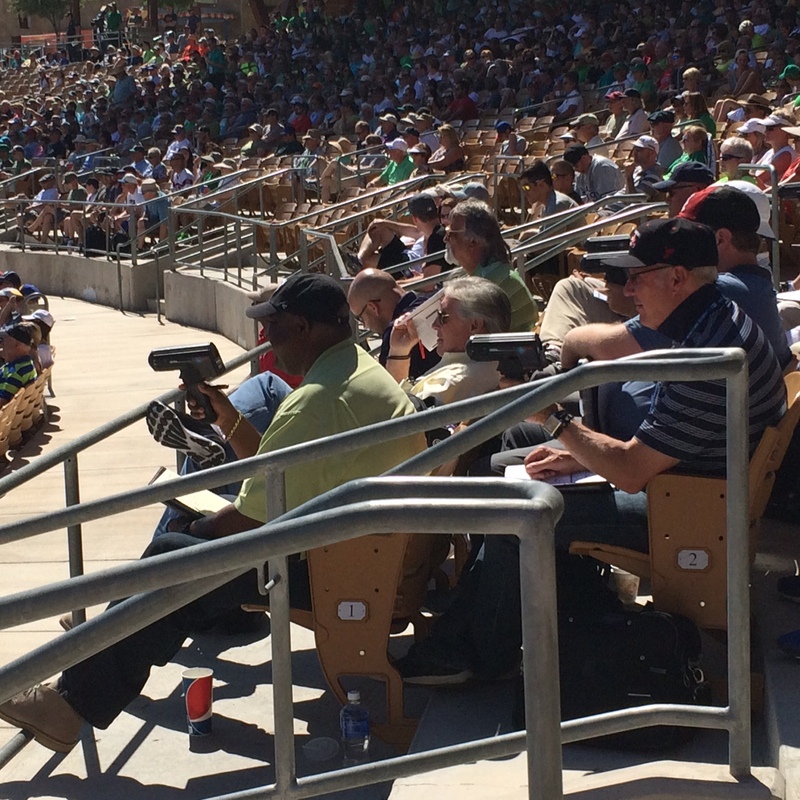 There were quite a few scouts in the stands! Two of the days were quite warm (90+) and we worried about Elko left back in the trailer. 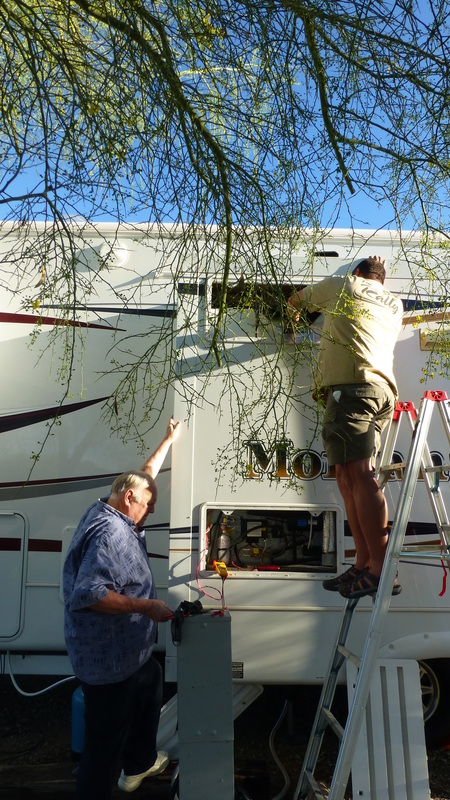 He had both air conditioners going, two 12 volt fans as back up, and we had confirmed that the park power was very stable – but it was still a relief to get back and see that he was fine. Randy is researching monitoring systems so that we can be alerted if temperatures rise in the trailer while we are gone. The heat did have an effect on our refrigerator. It was not cooling well so I took out fruits and veggies to allow for better air flow and Randy and my dad worked on adjusting external fans. All was well after modifications. 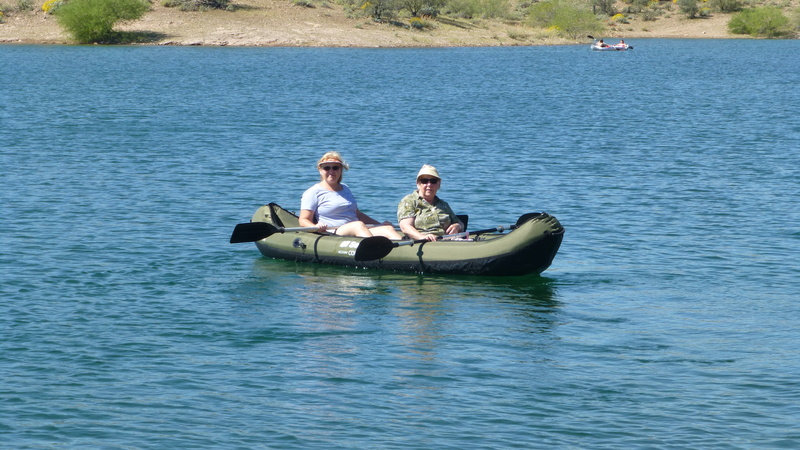 While they worked, mom and I enjoyed a canoe ride on Lake Pleasant. 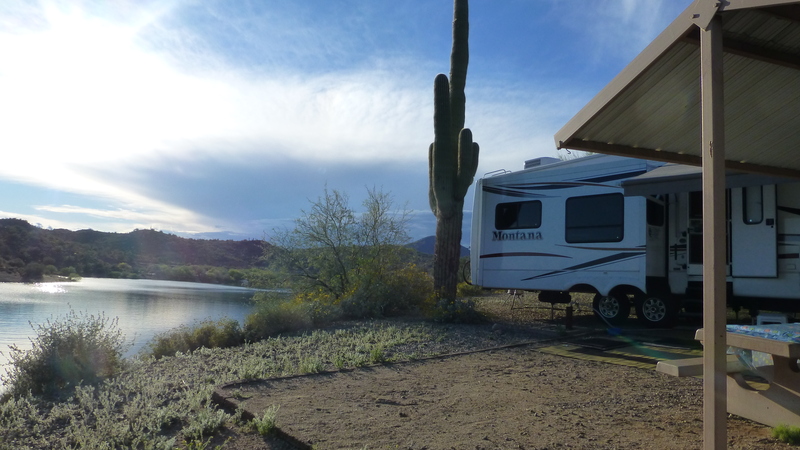 Lake Pleasant Regional Park is about 20 miles north of Phoenix and has a nice desert landscape with the bonus of a dam inspired lake. Our campsite was right on the lake and Elko enjoyed getting his legs and tummy wet several times each day. 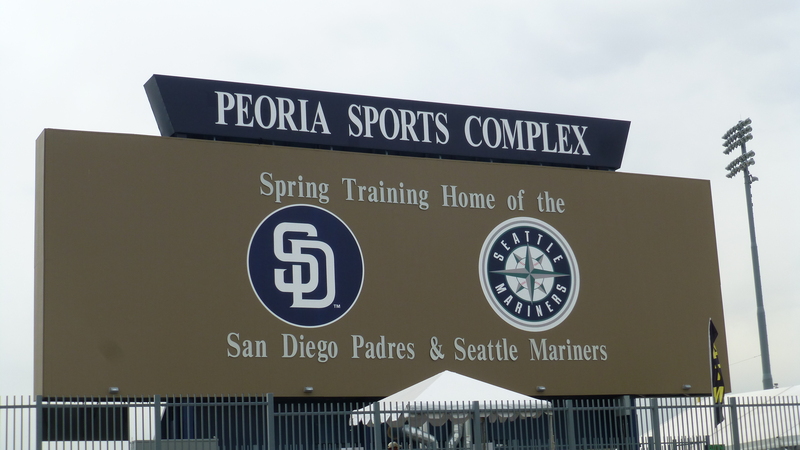 Yet, it will not go down as one of our favorite parks. There are swarms of some kind of gnat like insect every morning and evening. It was impossible to keep them out of the trailer. 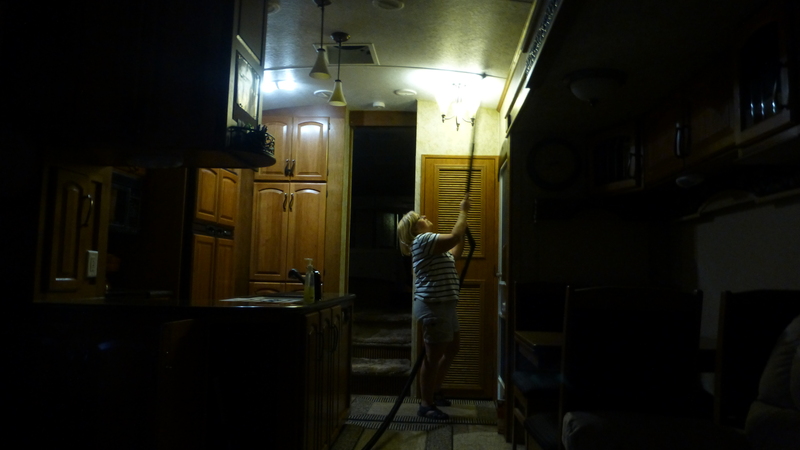 It became a nightly ritual to attract them to one or two lights and then vacuum them up. Also the clientele was a little rougher than the snowbirds we have become use to. Those playing loud music into the night and gun shooting campers aren’t our preferred mates. 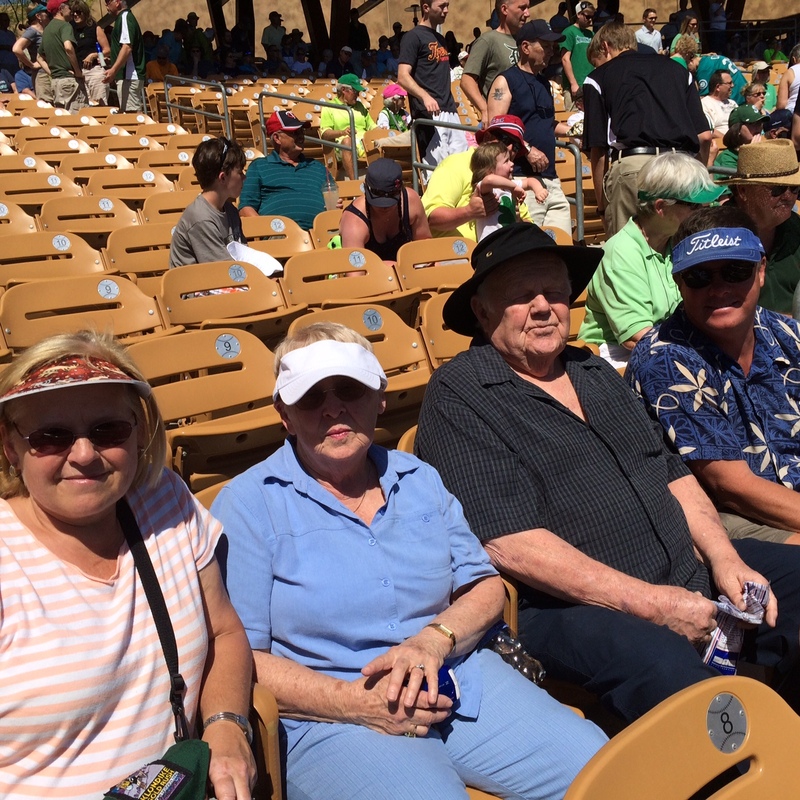 We did, however, meet a few nice people, including neighbors on one side who had come to AZ for Texas Rangers Spring Training and the neighbors on the other side spending their very first night in their new motorhome. They needed some help and Randy was glad to comply. 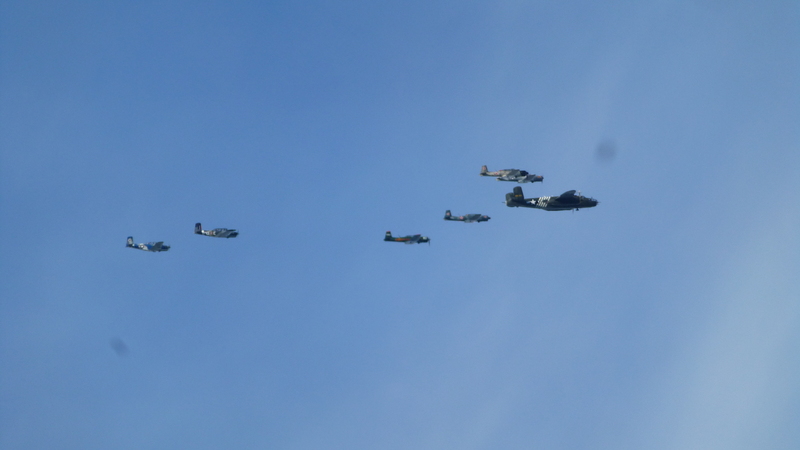 On our last afternoon we were treated to an air show! We couldn’t figure out whether it was part of an actual show, or just practice, but it was still fun to watch the formations and the pretend dog fights. They are headed back through Boise to see Natasha, Seth and great-grandson, Archer. Should be visiting right about now!